The Pustertal Wolves have also lost in their fourth final appearance, while Ritten Sport has won the Italian championship for the second time in the past three seasons. In the first four games of the series, it was always the road team to earn the victory. Therefore, it was Pustertal’s plan to prolong this streak in Game 5 in ‘Arena Ritten’. The plan also seemed to work out in the initial minutes, when Kevin DeVergilio on the 2-on-1 nicely fed Max Oberrauch to open up the scoring. DeVergilio even had the chance to gain a two-goal lead, but Ritten’s netminder Andrew Engelage denied the one timer. However, the Wolves got themselves into the penalty trouble and the ‘Buam’ made them pay. First, it was Brendan Cook’s lazer point shot on the two-man-advantage to tie the game, followed up by Dan Tudin’s 2-1 marker only eleven seconds later. Ritten, who defeated Pustertal already in the 2014 Serie A finals, kept the pace high and made it 3-1 at the beginning of the middle frame. Mark Van Guilder’s gorgeous backhand pass froze net minder Tyler Weiman, making it an easy task for Brendan Cook to score on the wide open net. The Wolves tried to fight their way back into the game, but Julian Kostner’s goal on a great assist by 18-year old Markus Spinell decided the contest in the 47th minute. Van Guilder and Emanuel Scelfo netted two more for Ritten, while Ryan Kavanagh’s goal was not more than a consolation price in a 6-2 hockey game. In Game 6, the Wolves coached by Kim Collins wanted to show its 2000 spectators in ‘Leitner Solar Arena’ how it could really perform. Pustertal also played a strong game, outshooting their rivals 17-10 in the first period. Ritten’s goalkeeper Andrew Engelage, who stopped 95.6 % of the shots he faced in the playoffs, continued his remarkable performance, stopping Patrick Rizzo’s one timer and Patrick Bona on the 1-on-0. 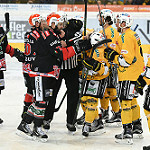 Armin Hofer had Engelage beaten with a slap shot from the hashmarks, but this time it was the post to deny the Wolves. The guests, who did not create lots of opportunities in the initial period with the exception of Alex Frei’s hitting the post, showed what efficiency means. In the 22nd minute, Markus Spinell and Julian Kostner again showed their chemistry on the 2-on-1, as Kostner had no problem to take advantage of Spinell’s pass. The two hometown forwards formed a crucial line in the post-season alongside Alex Frei, with both collecting a career-high 9 points in 14 playoff games. The Wolves kept trying, but Engelage kept stopping puck after puck. In the 37th minute the Canadian goalkeeper, who is rumoured to join EBEL-club HC Bolzano, made his only mistake of the game and Ryan Kavanagh made him pay scoring the equalizer. Engelage was not able to control a bouncing puck and Kavanagh did not waste this chance. Pustertal continued to create opportunities and Giulio Scandella had the go-ahead-goal on his stick. Scandella was able to find the rebound, but the puck would somehow not find its way past the goal line. On the counter attack, the Wolves defencemen Danny Elliscasis and Armin Helfer bounced into each other, leaving two forwards on the 2-on-0 you should never leave alone in the slot. Playoff topscorer Mark Van Guilder (12 goals and 11 assists in 14 games) gave the puck to Serie A’s best goal scorer Brendan Cook, who tipped in the 2-1 marker with his 43rd goal of the season. Trevor Johnson, on a perfect pass by Justin Maylan, had the next huge opportunity for the Wolves, but it was again Engelage with one of his 48 saves in the game to be in the way. Brendan Cook added the empty netter and Ritten could celebrate its second ‘scudetto’ in club history. Celebrating the Italian championship will also stay as the last milestone in the career of Emanuel Scelfo. The 36-year old forward has competed in Italy's top league since the 1997/1998 season, always playing for his hometown Ritten with the exception of two seasons in Merano. Both Pustertal and Ritten have worked their way up to become one of Italy’s hockey powerhouses in the last ten years. After qualifying for the finals for the first time in 2006, when Ritten lost in the final series against the Milano Vipers, the ‘Buam needed three more final appearances before winning their first national championship in 2014. Two seasons ago it was also a heroic goaltender performance to steal the show, when NHL-net minder Chris Mason robbed Pustertal of a couple goals to win the series in seven games. Also last season Ritten went to Game 7 in the finals against Asiago, losing it eventually. For Pustertal it was the fourth loss in a final series since 2011. The 4-1 win in Game 1 of the 2011 finals against Asiago also remains the only time the Wolves have been able to win a game of a final series on home ice. This season they came close again to finally win the ‘scudetto’, but experience, efficiency and roster depth were the difference makers for Ritten. One man to feel especially unlucky must be forward Giulio Scandella. Scandella, a key player of Italy’s national team, has played in all big clubs in Italy since joining Asiago in 2004. Playing for Asiago, Milano, Bolzano, RItten and now Pustertal, the Montreal-native qualified for the final showdown six times and came up short in the end every single time. With the 2016 Serie A season ended, this could have very well been the last Italian championship awarded in an only national competition. The four South Tyrolean Serie A clubs are pushing to merge the Italian league with Austrian second tier ‘International League’. With only seven clubs remaining in Serie A, as it seems unlikely that Valpellice can overcome its financial difficulties, the plan is to cooperate with EBEL and create a new league with teams from Austria and Slovenia. While the sportive level of this new league might be lower than the one of the current Serie A, the goal is especially to improve attendance with the help of the marketing-department of Erste Bank Eishockey Liga. So once again, Italian hockey is awaiting an interesting off-season.